will be released as a vinyl 7" b/w another never-heard track, 'Whole Lotta Talking'. In 2018, it will have been 60 years since legendary guitarist Link Wray released his influential instrumental song 'Rumble,' and changed the face and sound of rock and roll forever. Easy Eye Sound is proud to release 'Son of Rumble,' Link's intended but never released follow-up to the song that introduced the world to power chords and intentional distortion. and Elvis Costello. The song was banned in New York, Boston, and Detroit, for fear it would incite juvenile violence, making Wray the only artist in history to have a banned instrumental. Thirty-three years after becoming eligible, this unsung hero of rock and roll is currently a Rock Hall nominee for the Class of 2018! Link Wray is one of the featured artists in the Sundance award winning movie 'RUMBLE: The Indians Who Rocked the World', a documentary about the profound, essential, and indelible impact Indigenous people have had on American music. The film includes interviews with Dan Auerbach, Iggy Pop, George Clinton, Slash, Steven Tyler, and other notable musicians. The story of Link Wray sounds like something straight out of a Hollywood movie. In 1937, a boy from the Shawnee Indian tribe was taught guitar by an African American traveling carny named Hambone in the segregated south. In 1953, that boy became a Western Swing musician who played the wake of Hank Williams. By 1956, he was a Korean War Veteran who lost a lung to TB and was told he'd never sing again. Yet, Link Wray spent the next half-century as the only one-lung singer in rock and roll, and laid the foundation for what the genre would become. The impact of Link Wray, placed in the top 50 of Rolling Stone's Top 100 Guitarists of All Time, can be heard in generations of American and British metal, punk, garage, grunge, thrash, and psychobilly rockers, all of whom have claimed him and 'Rumble' (and follow-ups 'Raw-Hide,' 'Jack The Ripper,' 'Ace of Spades,' and many more) as their own. There's a new Link Wray release on the cards that will amaze all fans of the iconic guitar hero. 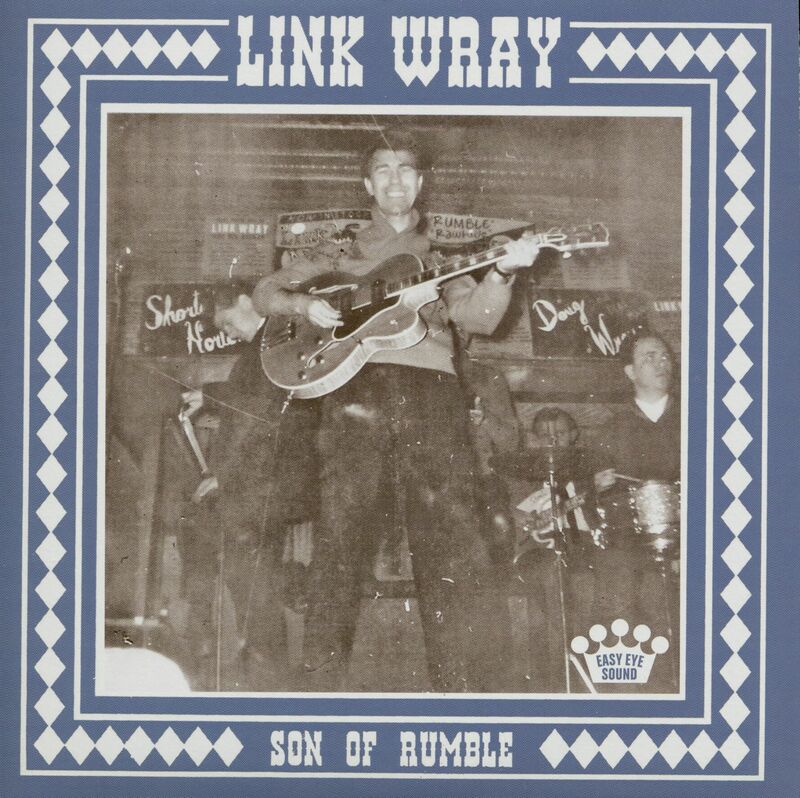 I've been researching the legacy of Link Wray for almost 40 years now. Just about the time I think all the pictures have been found, all the stories have been told, all the music has been heard - something comes out of the woodwork that floors me. Last year, I learned of the existence of a one-off. two-song acetate disc. One label had a Broadway Recording imprint, and typewritten across the label was a song title that took my breath away - 'Son Of Rumble'. Could it be the Link Wray 'holy grail'? The follow-up to 'Rumble', the song that changed the face of Rock'n'Roll? I had to find out. Here's what I unearthed. Broadway Recording Studio was located at 1697 Broadway, in the old Ed Sullivan Building. During mid-to-late 1958, Link walked into the studio and laid down 'Son Of Rumble' and one other track. For reasons we'll never know, they were shelved for the next half-century. After working with Rezolution Pictures, the people who produced the excellent film 'Rumble: The Indians Who Rocked The World', I learned that Dan Auerbach of The Black Keys was a huge Link Wray fan. He had just started his own record label, Easy Eye Sound. I reached out to him, and his team got the 'Son Of Rumble' release rolling. 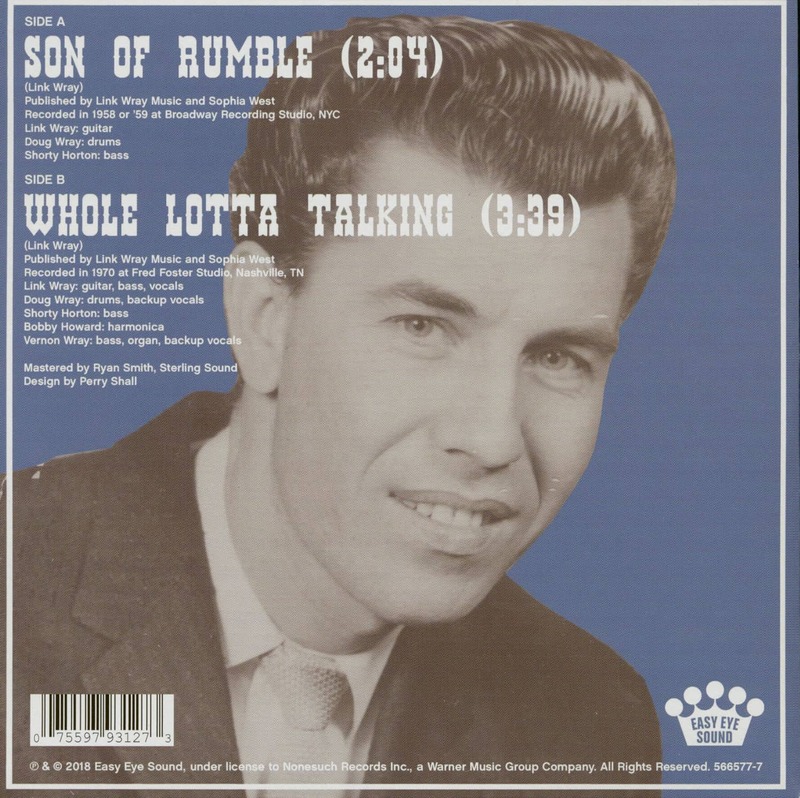 The flip side of 'Son Of Rumble' will be another unreleased Link studio track, 'Whole Lotta Talking', which originates from a session Link did in Nashville in 1970. It's got a cool '68 Comeback Special groove to it. It is quite different from Link's Shack sessions later that year. 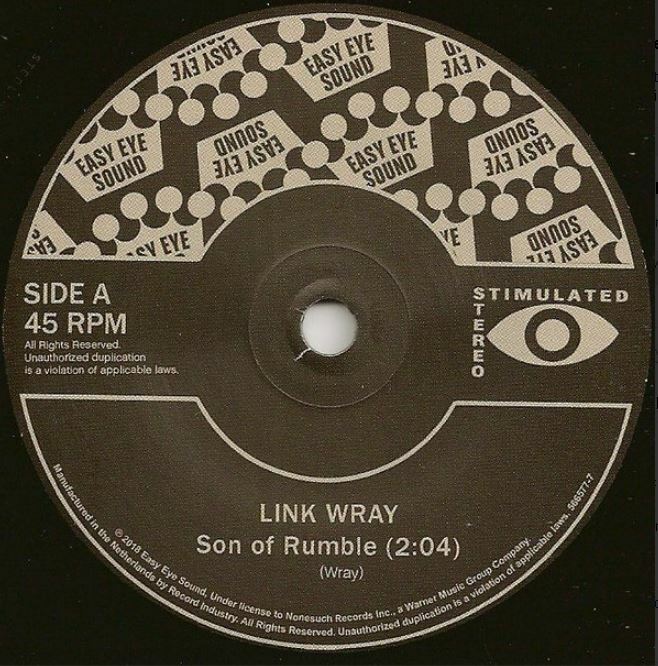 Link Wray played the most important D chord in history: it opened Rumble. Guitarists often remember where they were when they first heard it. 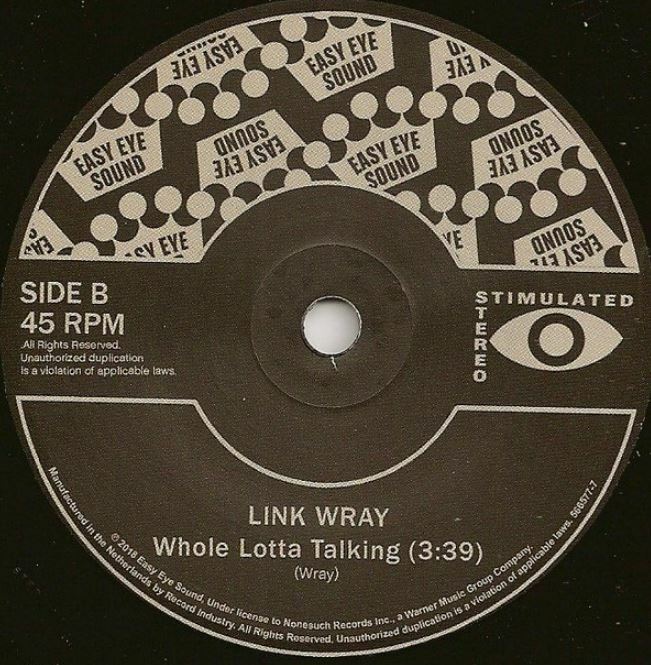 Thirteen years later, Wray signed with the newly-launched American division of Polydor, and his back porch sound could almost have emanated from another Link Wray. The extended Wray family was living almost communally on the family farm near Accokeek, Maryland, an hour south of Washington. "Papa started building a chicken coop and a porch on the house," Link told Tom Zito in 1971. "Then he built a room onto the porch, and then another room onto that and pretty soon it was all connected. Ray moved his three-track recorder into one of the rooms and we converted the coop into a studio, but the two were never connected so we still have to yell back and forth, 'Is it running, Ray?' every time we want to start." One of Link's steady gigs was at the Two Thieves Club in suburban Maryland. There, he was heard by Steve Verocca, an Italian who'd come to the States in the wake of Volare, an Italian song he claimed to have produced in its original version by Domenico Modungo. "I was overwhelmed by [Link's] music," said Verroca. "Here was a man on-stage singing out his soul, so I asked him about recording an album and he told me about his past experiences, and I suggested we do it at the Shack. I believe the Shack has a soul. You can hear people burping on the record, and that's great. It's real." When Verroca had no success placing the LP, it was handed to Bob Feldman, who'd been in the Strangeloves and had produced the Angels' My Boyfriend's Back. Feldman had known Link when they were touring together in the late '50s, and was both moved and intrigued by the new record. "Every so often, magic happens," he said. Given the rights for ninety days, he placed the LP with the new American division of Polydor Records. Lyrically, Wray's new songs weren't especially strong, but the funky, organic vibe was compelling. If Rick Nelson's reinvention was still in character; Wray's was a complete 180 degree turn. Customer evaluation for "Son Of Rumble (7inch, 45rpm, PS, SC)"